Party spokesman: "Every vote that she gets helps the Green Party"
(CNN) -- The liberal environmentalist Green Party nominated former Congresswoman Cynthia McKinney as its presidential candidate Saturday. 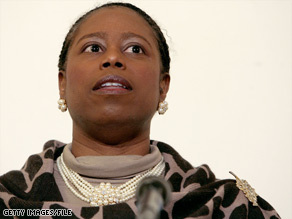 Cynthia McKinney represented a suburban Atlanta, Georgia, district for six terms as a Democrat. McKinney, 53, held off three rivals to win the party's nomination during its convention in Chicago, Illinois. She picked journalist and activist Rosa Clemente as her running mate. Green Party spokeswoman Scott McLarty acknowledged McKinney was a "long shot" for the White House, but said, "Every vote that she gets helps the Green Party." "The United States needs an alternative party," McLarty said. "The narrow two-party system we have right now has not served us very well." McKinney represented a suburban district of Atlanta, Georgia, as a Democrat in the U.S. House of Representatives for six terms -- five consecutively. First elected in 1992, she lost a primary challenge in 2002 after suggesting in a radio interview that members of the Bush administration stood to profit from the war that followed the September 11, 2001, terrorist attacks on New York and Washington. In 2004 she ran again and won with a low-key campaign in which she largely avoided controversy. But voters ousted her again in 2006 after she was accused of a physical altercation with a U.S. Capitol Police officer who questioned her after failing to recognize her at a security checkpoint. The most successful Green Party presidential candidate was consumer advocate Ralph Nader, who drew nearly 3 percent of the vote in 2000. Nader is running again this year, this time as an independent. Earlier this year, the Libertarian Party nominated McKinney's onetime House colleague, ex-Republican congressman Bob Barr, as its presidential nominee. Barr also represented a district in the Atlanta suburbs during his four terms in Congress. CNN's Brendan Gage contributed to this report.